When we originally redid our pantry in 2012-13 I really tried to give the project a lot of forethought and create pantry organization systems that would remain neat forever. Of course, that was wildly idealistic! In any organizing project, you are going to need to adjust and adapt over time. So today I’m sharing my new top ten best tips for creating pantry organization. Some of these are the old classics, and a few are things I learned with time and perspective. You can also check out five mistakes I made when trying to create an organized pantry here! This post contains affiliate links for your convenience. Please see my disclosure here. 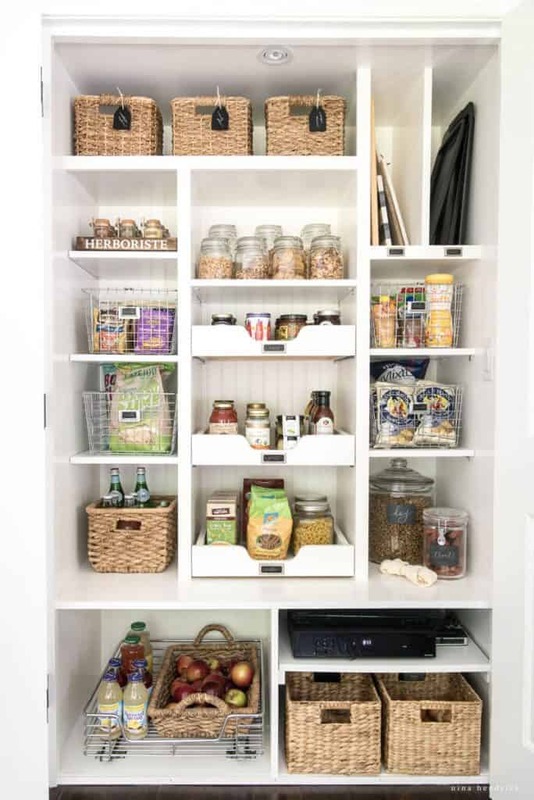 The best way to start is to make a list of all of the challenges you have with your current pantry organization and brainstorm ways to solve them. For example, the former closet that served as our pantry was very deep. You will notice that in the new pantry that the shelves are set back from the two bottom cubbies. I am not very tall, and I have very short arms (cue the t-rex jokes). It is much easier for me to find and reach things when the shelves and drawers aren’t as deep! Now, this isn’t a requirement, but I have definitely noticed that I’m much more likely to keep a space organized if it’s pleasant to look at. That goes for pretty much any organizing project. I have gone as far as to contemplate glass doors- I love my pantry that much! When I originally planned the pantry, I labeled everything. I was just a bit overzealous ;). However, I do feel like some labels are useful. I tend to label more by category now, especially as my boys are getting to the age where their chores include putting away groceries or grabbing something for me while I’m cooking. The labels keep us all on track. One of my favorite features in this project is still having the drawers for cans and other items that slide out. I feel like this is a must for any deep space that isn’t easy to access. We built the drawers from scratch, but there is a kit available here that is prebuilt. 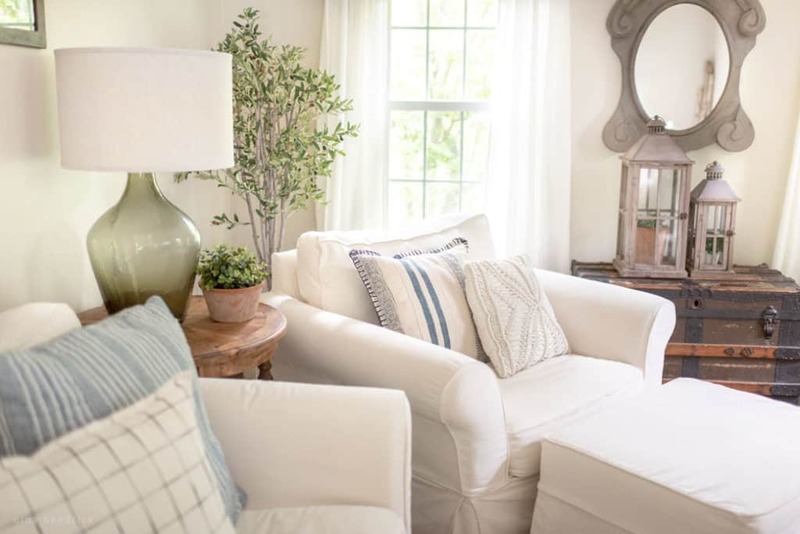 I am a big fan of using glass jars in every room, and I think it truly helps to keep a space neat. You can measure quantities more efficiently, and there are no more empty boxes sitting on the shelves. When we designed the pantry we adopted the concept of adjustable pegs and holes using the Kreg Pin Jig. In every section, we can adjust the drawer and shelf heights with our changing needs. We haven’t found that we had to do this very often, but I appreciate that the option is there. Rather than having a bunch of small items kicking around, it’s so nice to be able to keep them neat and contained by corralling them in pretty baskets, trays, and crates. It can also save time- for example, you can store all your most frequently used spices on one easy-to-grab tray. When we first built this space, I went way too long without making use of the real-estate on the doors. Now there are can and bottle organizers, which freed up even more space on the shelves and drawers! In my experience, cookie sheets tend to get the raw end of the deal in the bakeware cabinets. They end up at the very bottom of the stack, meaning you have to take everything else out in order to get to them. Storing them upright in the pantry has been such a great solution in our home, along with the easily-accessible cutting boards! If you’re like me, you probably can’t reach the top shelf very often. I could store a footstool at the bottom of my pantry pretty easily, but I choose not to because of my children. In their reach, it would become a way up onto the counters, to the candy above the fridge, and other things I don’t even want to think of. Instead, I choose to store things up high that don’t get used very often. I can get to them if I absolutely need to, but that isn’t frequent. 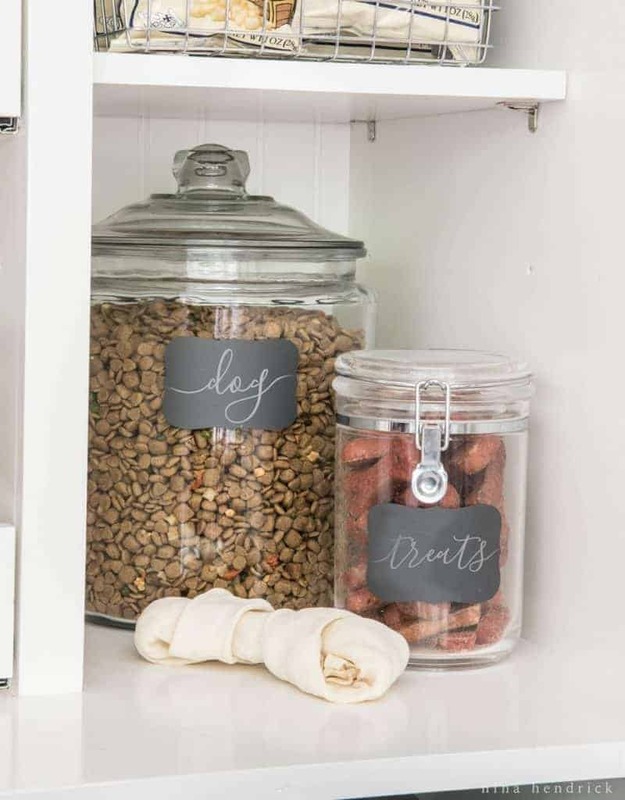 I hope that you found these pantry organization ideas helpful! Creating a system for a particular space in your home can be a lot of work, but I find that it is always worthwhile. With minimum maintenance, our pantry stays very organized, even with my kids going through it constantly. I hope that if you tackle this project that you’ll share it by tagging me on Instagram @ninahendrickdesign, I love to see your organizing projects! I love the way it turned out! Beautiful and fresh…love it! Where did you get the blue labels from? Thank you so much! :) I created the blue labels. I measured the little slips of paper that came with the Martha Stewart for Avery bookplates, and designed and printed a little label to fit! Nicely done! Thank you for answering so quickly. Also did you make the other labels yourself? They are cute! Do you have a link to the pull out drawers? Love your pantry. If it were mine, I would use that bottom shelf as a ladder to get to the top shelf. Awesome idea! Congratulations on your new house and thank you for your kind words! “The List” can be a blessing and a curse- sometimes it keeps me on track, and other times it seems so huge that we will never get to it all! But I know that someday we will have our complete dream home, and we will have worked hard to get there! I used to get so frustrated with myself if I didn’t get everything on my list done in a day. Then I would start my list for the next day and have to add my uncompleted item(s) to that list. Very frustrating. Then I went to a seminar and learned that I need 2 lists, my daily list and long term project list. Now I complete my daily list, feel content with what I accomplished, but I don’t have to keep seeing all those time consuming projects as uncompleted daily. Hope this helps someone. Thanks for all your organizing tips. That sounds like a great strategy, Pat! Thank you so much for sharing and for stopping by! I love your pantry, if only i had that much room. sigh!! True inspiration right here. We have an pitiful excuse for a pantry but really do not have any way of making it bigger so slide out drawers is a wonderful idea!! Thank you Kelly! The drawers are really my favorite feature! 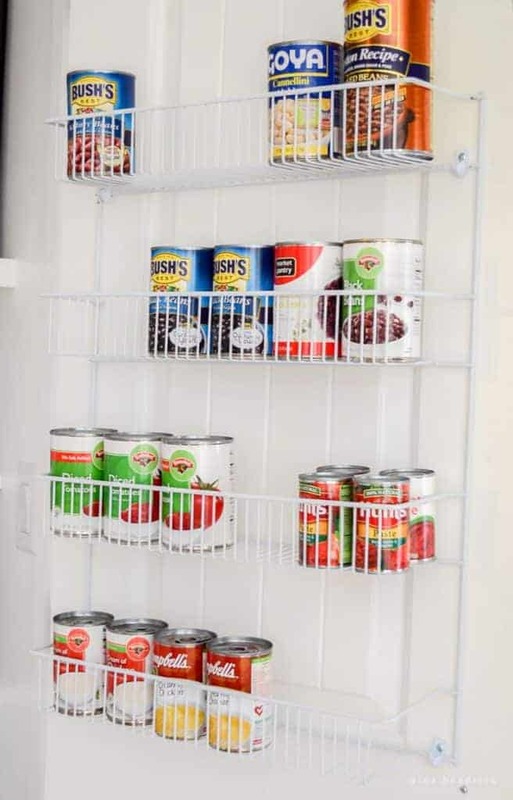 If you are still having trouble finding can organizers, check out this DIY: http://www.shanty-2-chic.com/2012/10/pantry-ideas-diy-canned-food-storage.html. I think this is the route we will have to take with our own pantry! Beautiful! How wide is your pantry? How wide are the pull-out drawers? It is providing some much-needed motivation for my pantry, although I won’t be able to copy yours exactly. I love this. I would love to find the pantry kit components but can’t find anything on the lowe’s website. Can you provide the brand name? The pantry was actually custom built out of wood by my husband, we opted not to use a pantry kit. Hi. Can you tell me what kind of wood your husband used and how thick? I doubt I can get my husbAnd to do this but I’ll try. Thanks, great job! We used standard 3/4″ cabinet-grade plywood and trimmed it out with pine 1×2″ trim! I hope that helps! Love your pantry – every inch of it! Definitely providing major inspiration for my own pantry redesign! 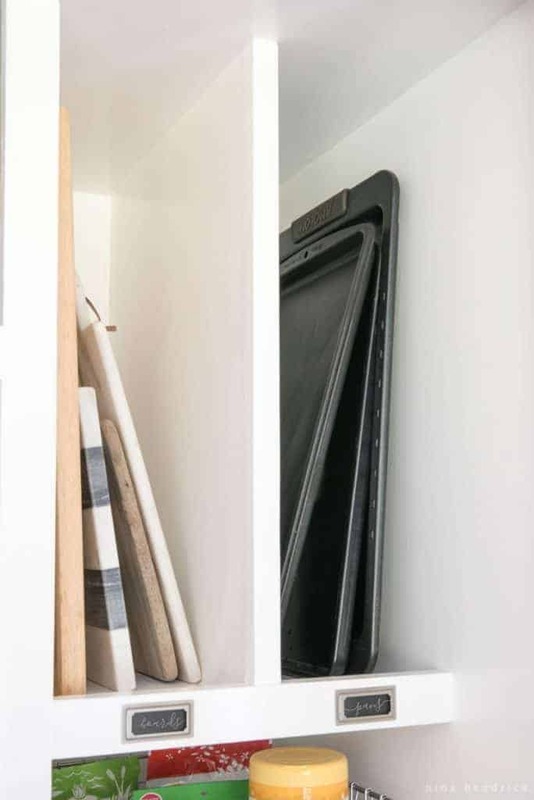 Could you share the source you used for your custom doors? Thanks! I’m so lucky I found your blog. I have major problems with my pantry and I need organization ideas so your post was the answer to my problems. I love the idea of having drawers installed but I was wondering where you got them from and if they have a certain name so I can find them at the store because it seems like they are only half tall compared to regular drawers and also they are open at the top. Were they easy to install? Because I would have to do it myself! The drawers were custom built by my husband! I know that Martha Stewart makes a line for Home Depot that includes drawers, but I’m not sure of the specifics. I hope that helps. OH, gotcha! 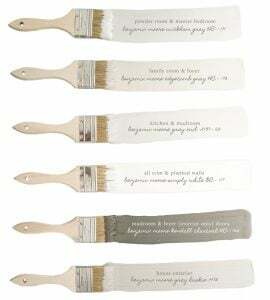 Since you had a link to the Martha Stewart drawer I thought you guys bought them. I guess I could buy the drawer and get the sliding brackets separate right? I know I’m commenting on an old post, but we are in the middle of building a walk in pantry and I’m fishing around pinterest for ideas. I’d love to see a picture of the “box” before it was all painted and prettied-up. I love all the wire baskets! Perfect! Love everything about this!!! Researching pantry ideas and love!! So, dumb question, where and how did you go about buying the wood for shelving, etc.? Thanks! Ahhhhh, the stuff of my dreams… Except you are real- proof that I can do this! Thanks for inspiring me! I love your pantry! What size or what are the dimensions of your pantry? I know this is very old, but can you tell me where you got your wire baskets?? 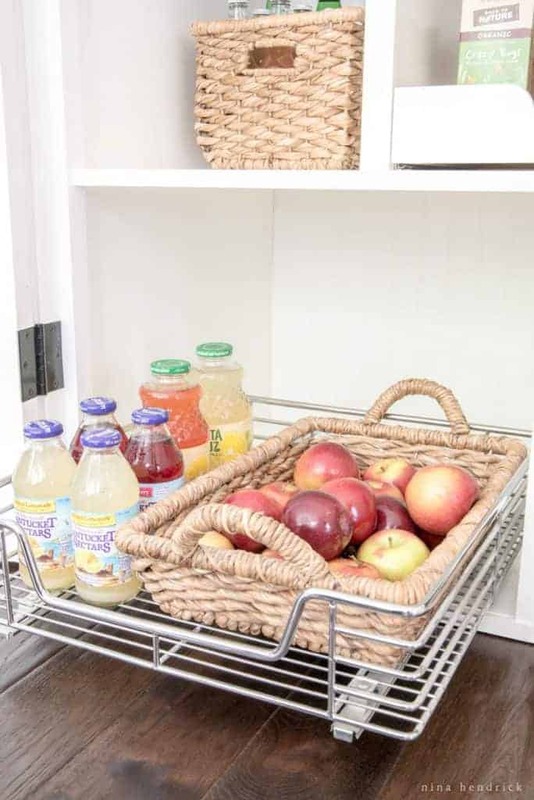 I’m working on my pantry and looking for baskets exactly like these! It shouldn’t be hard, but for some reason I’m struggling to find any. Thanks ! Hi, Rachel! They are available here!